Will the Westbury outfit La Masia defend their Walter Sisulu Challenge Cup? 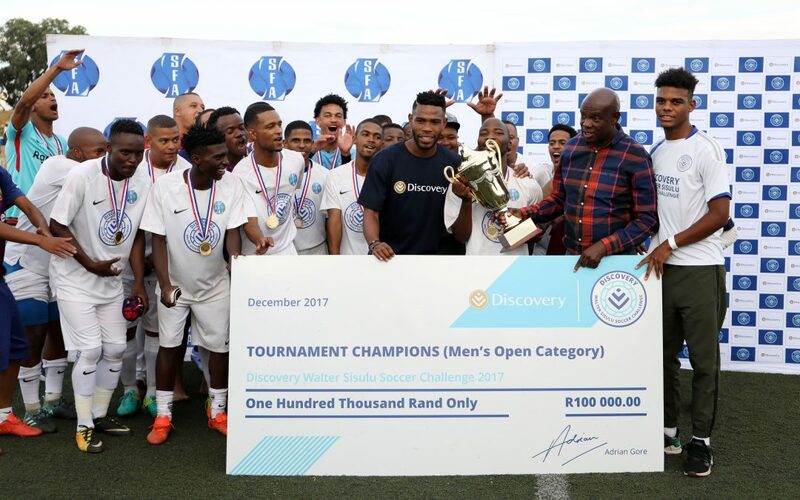 2017 DISCOVERY Walter Sisulu Soccer Challenge winners La Masia, are determined to defend their cup in this year’s edition of the tournament. 2017 Discovery Walter Sisulu Soccer Challenge winners La Masia, celebrating their win. Will they be able to defend their title in 2018, shall await the final whistle? The annual soccer tourney that has already kicked-off the 2018 campaign at the Nike Stadium, Klipspruit (Soweto), has been a hive of activities with La Masia looking forward to open their account today against Meadowlands All Stars. Kick off 3pm. Last year they pocked a cool R 100 000, floating trophy and gold medals for their effort. Launched in 2002 the Discovery Walter Sisulu Soccer Challenge, tournament plays an important role in developing soccer in our communities, whilst making sure that all players are united in achieving a healthier lifestyle. It is named in honour of political struggle icon and Anti-Apartheid activist utata Walter Max Ulyate Sisulu. The revered tournament draws top stars, scouts and football administrators country-wide. According to Westbury outfit La Masia, to them this helps to draw kids away from streets, and rather focus on healthy living, through sport and particularly football. All the games take place at Nike Stadium, Soweto. One Response to "Will the Westbury outfit La Masia defend their Walter Sisulu Challenge Cup?"